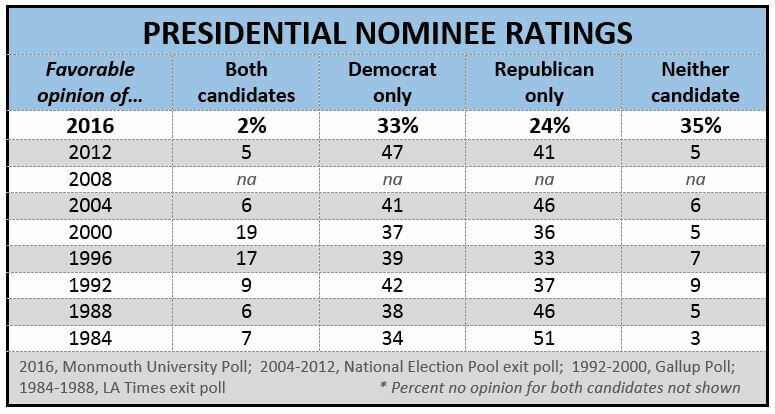 Monday, Aug. 29, 2016 at 12:28 a.m.
A Monmouth University Poll released today (http://monmouth.edu/polling-institute/reports/) underscored the historically high level of negative attitudes toward both major party nominees for president. The number of voters who cannot bring themselves to voice a favorable opinion of either major party nominee is unlike anything witnessed in past elections. Only 2% have a favorable opinion of both Hillary Clinton and Donald Trump while one-third (35%) do not have a favorable opinion of either candidate. These results are unprecedented according to polling data going back more than 30 years. The number of voters in elections going back to 1984 who had a favorable opinion of both candidates was never lower than 5% – in fact registering as high as 19% in 2000. Conversely, the number of voters who did not have a favorable opinion of either nominee was never higher than 9% – a fraction of what is being seen in the current election. Among the 1-in-3 voters in the current poll who do not have a favorable opinion of either nominee, 21% say they have an unfavorable opinion of both candidates, 7% have an unfavorable view of Clinton while expressing “no opinion” of Trump, and 8% have an unfavorable view of Trump while expressing “no opinion” of Clinton. Even taking into account differences in question wording and methodology compared to past election polls, the number of voters who hold negative views of both candidates is indisputably a record high. Monmouth combined the data from its four national polls conducted this summer to get a better sense of these disapproving voters. Based on this four-poll average, those with an unfavorable opinion of both nominees are dividing their support almost evenly among Trump (24%), Clinton (21%), and Johnson (22%), with Stein at 8%. Among those who hold a negative view of one nominee and no opinion of the other candidate, however, the vast majority are voting for the candidate of whom they have no personal opinion. This includes 77% of the “unfavorable Clinton/no opinion Trump” group who are voting for Trump and 75% of the “unfavorable Trump/no opinion Clinton” group who are voting for Clinton. This is not surprising because the vast majority of “no opinion on Clinton voters” lean Democrat and the vast majority of “no opinion on Trump” voters lean Republican. It just seems that they can’t bring themselves to admitting to a favorable opinion of the person they are grudgingly supporting. It’s also worth noting that there are more Republicans than Democrats among voters who have an unfavorable opinion of both candidates and this negative group is also much more likely to be college educated. The demographic composition of each voter group is below. · 29% are Republicans and 21% lean Republican, 13% are Democrats and 20% lean Democrat, and 18% are self-described independents who do not lean toward either party. It’s also worth noting that nearly 1-in-4 of those voters who do not have a favorable opinion of either candidate are considered to be unlikely to turn out to vote this November. This compares to less than 1-in-10 with a favorable opinion of one of the candidates who are considered to be unlikely voters. Another historical note: the difference between the two candidates’ favorability ratings correlates extremely closely with the actual margin of victory. For example, Barack Obama had a 6 point advantage over Mitt Romney in candidate favorability in 2012 and ended up winning the popular vote in that election by 4 points. Ronald Reagan had a 17 point favorability advantage over Walter Mondale in 1984 and won that election by 18 points. Even in the razor thin election of 2000, Al Gore had a one point favorability edge over George W. Bush and won the national popular vote by half a percentage point despite losing the Electoral College. The same is true in 2004 (favor +5R; vote +3R), 1996 (favor +6D; vote +8D), 1992 (favor +5D; vote +6D), and 1988 (favor +8R; vote +7R). According to the average of recent polls reported by HuffPost Pollster, Clinton has about a 6 point advantage on this metric. There are also intriguing down-ballot implications. Some pundits point to the 1996 election when the GOP tried to disconnect the Congressional races from its presidential nominee who was trailing in the polls. In that year, however, opinion of Bob Dole was fairly positive, with 50% of voters holding a favorable opinion of him. This year, the top of ticket nominees in both party are largely negative, with Trump doing significantly worse among his fellow Republicans than Clinton is doing among her fellow Democrats. This suggests that the GOP could have a bigger problem holding its base in down ballot races where their nominee is seen as aligned too closely with Trump. Why do you assume that undecided voters will only choose between Trump and Clinton? In fact, not one single voter in the entire nation will be faced in the voting booth with this scenario. Why does your institution insist on phrasing questions that are not reflective of the choices voters will actually face in November? How does Monmouth Poll connect with voters: via landline or via cell phone?